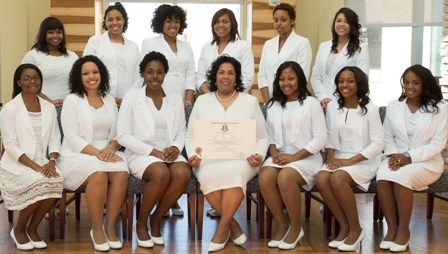 Alpha Kappa Alpha Sorority, Inc. charted a new chapter on the campus of University of Southern Indiana on Sunday, April 21, 2013 as reported by the student newspaper, The Shield. The new chapter began with 12 new initiates. David Stetter, fraternity and sorority life director, said USI has worked for over a year to find 12 women, which is the minimum amount of required members to charter, who met the GPA requirements and could meet the financial requirements. “I’m really proud of them, and I’m really, really excited,” Stetter said. He said when he started working at USI in 2010, a student’s parent said she wanted to start discussions about creating an AKA chapter at USI. He said having AKA on campus will challenge the way current sororities and fraternities look at Greek and campus life. Other African-American fraternities and sororities have been at USI but have dissolved because members graduate and don’t get replaced, Stetter said. The only other African-American sorority to charter at USI was Delta Sigma Theta, which was last recognized on campus in 2008. It was an Evansville city chapter between USI and the University of Evansville. Stetter said the establishment of AKA will lead to more National Pan-Hellenic Council (NPHC) organizations, historically African-American fraternities and sororities, coming to campus. He said the chapter will be governed by USI’s Panhellenic council, until another NPHC chapter is on campus, then it will break off and be governed by a USI National Pan-Hellenic Council, which will be formed from members of the NPHC fraternities and sororities. Pamela Hopson, the President of Zeta Zeta Omega, the local graduate chapter of AKA which helped bring the sorority to campus, said she’s excited. Associate Provost of Student Affairs Marcia Kiessling said it’s a historic moment for the institution. She said it will also help with recruiting students to the university. “As students consider different schools and see (AKA) is one of their many options, that is an asset to our institution,” Kiessling said.